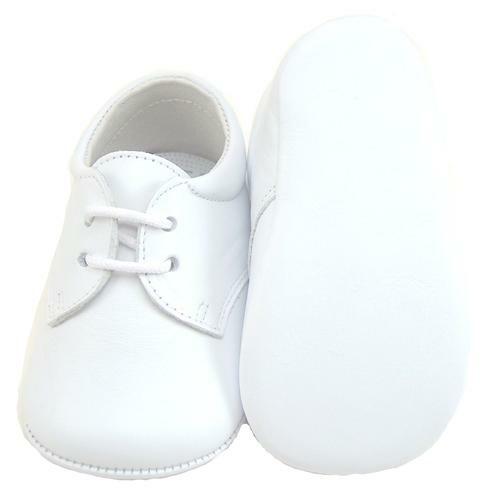 Classic dress crib oxfords in premium white leather are perfect for special occasions. Handcrafted in Spain using top quality components. Full leather breathable lining and cushioned insole. Padded heel collar for comfort and secure fit. Soft self-leather sole. FITTING: Shoes vary so please compare foot length with insole measurements, allowing about 3/8" for socks, wiggle room & growth - consultations always OK: EU 16/US 0 = 3 3/4", EU 17/US 1 = 4", EU 18/US 2 = 4 1/4", EU 19/US 3 = 4 1/2", EU 20/US 4 = 4 3/4"